Today due to circumstances beyond my control I wound up at an English language Mass. In Catholic-speak that is Novus Ordo. At least there were not altar girls. But it was excruciating. And long! I will not belabor things but I will just run down the highlights, or, shall I say, lowlights. Zut alors, this was a terrible day for me and earworms. 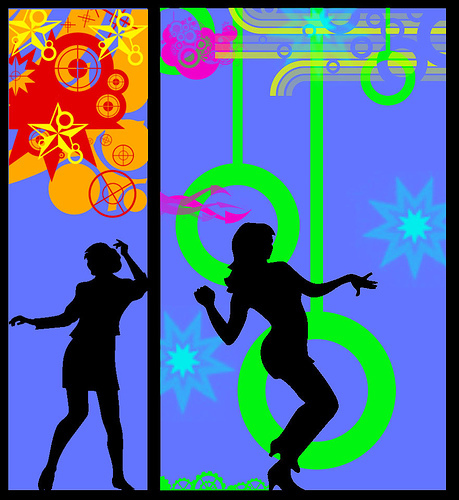 Before "Table of Plenty" it was this riff from a Zumba song that would not go away. I am not sure which one was worse. Here I am the authorized biographer of Leonard Pennario and I have "Table of Plenty" on my brain instead. The rest of the songs at church today were no better. I am just not used to these modern Mass songs anymore. I mean, listening to that link, I guess it is a kind of nice folk song but not the kind of thing that will make you accept that a miracle is real. I need Mozart and/or Gregorian chant. Another thing that happened was during the Sign of Peace. I had almost forgotten all about the Sign of Peace because you do not deal with it at Latin Masses. The priest went into the crowd and stayed there for an incredible length of time. You could hear him talking and joking around. The organist began noodling around, using the Roller Rink stop. From time to time I kind of looked over my shoulder praying the priest was heading back to the altar but no, he was back in the corner, socializing. Eventually he made his way back up and on the way he kept stopping to say hi to this person and that. One woman pulled him aside and started talking to him and he was in no hurry, he stayed and talked to her and then finally went back to the altar. Admiring mention was made of the Journey of Faith and Grace. Could we please just not mention the Journey of Faith and Grace? That was the shutting down of all our churches. It was terrible and tragic and I have gone forward but I just do not want to hear about it any more, you know? ... would not have liked this Mass any more than I did! I get out of my pew, ignoring the ushers -- I noticed too late that there were ushers trying to take us row by row, which I hate -- and I slipped into the priest's line. So far, so good. But then I get up to the priest and he holds up this big irregular-shaped piece of bread -- I guess they had broken a big piece into smaller pieces. I opened my mouth and kind of gestured, trying not to make things too awkward. After a long couple of seconds he grasped the situation and he reached into the cup and picked out a conventional round host. "The other one was too big for your mouth," he said. I smiled obediently but I felt he was mocking me. A couple of minutes later I thought, oh well, he was just making a joke. But do you have to make a joke at Communion? Can't you just say "The Body of Christ?" Now I am all distracted and stressed. I made my way back to my pew and you would not believe this, everyone around me was all mixed up because someone had gotten into the wrong pew. The people in front of me and I exchanged all this sign language about the situation but when I politely tried to return to where I had been sitting, they went and sat there instead. No matter that my purse and my missal (nerd!) were there on the bench! They just sat right down with them. The pew behind my pew was empty so I slipped in there and reached over and discreetly grabbed my things. 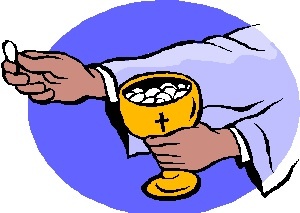 The guy in front of me did not kneel after Communion, he just sat, and I was momentarily in such a daze that I sat, too. Then I realized I should be kneeling. I knelt and did that thing where you cover your face -- and then, I know this sounds dumb, but I actually started to cry. It was just such a terrible Mass! There was something symbolic about how those people had taken my pew. There was no place for me! My co-worker Jeff Simon came up with the greatest phrase. He once described something as "deeply annoying." I love that because it gets to the truth that annoying does not have to be just middling or skin deep. It can be deep. This Mass was deeply annoying. God forbid you try to show any respect, you know? You can't kneel for Communion and you are hassled when you try to receive in a way that makes you feel reverent. You cannot pray after Mass because the place is in an uproar. Oh, and a mantilla, forget it. Howard was telling me I should go ahead and wear the mantilla. "Who cares what anyone thinks?" he said. But I said, "Howard, I would look like the biggest dork." Oh, well. As my friend Adrienne commented another time I wrote about something like this, it is just another day in Novus Ordoland. 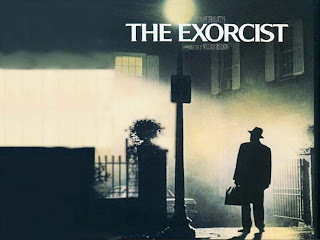 Today I was following my brother George to the Clinton-Bailey Market and on the radio I caught an interview with the author who wrote "The Exorcist." I never read that book but one day I am going to. I did see the movie but it was a special edition that came out a couple of years ago. It had some scenes that I guess were not in the original. Holy cow -- or unholy cow, I should say -- I had to sleep with the light on! Before today I could not have told you who wrote "The Exorcist." Now I realize he was originally this comedy writer who wrote screenplays for Inspector Clouseau movies, among other things. In the interview he says: "I am hauled out of my burrow every year around Halloween as if I were some furless, aging demonic Punxatawny Phil. It always brings a smile of amusement to my lips." Asked about "The Exorcist," he also says, believe it or not: "I have zero recollection of any intention to frighten the reader in the slightest." Amazing. Blatty is 84, I think. I did not get to hear the whole interview on the radio because we got to the market and I could not just sit there in the car with George waiting. But when I got home I found it on YouTube. Fascinating! You get to hear Blatty reading from "The Exorcist" which is priceless. Blatty wrote the book in a cabin in the woods on Lake Tahoe. That is really amazing. This is not the kind of book I would want to write in a cabin in the woods, I will tell you that. I could see writing about Leonard Pennario while sequestered in an isolated cabin, but "The Exorcist?" I do not think so. Blatty says several priests told him "they had never seen such a thundering herd of people coming to to the confessional as they did after the release of this novel." Hahahahaa! Well, really it is no laughing matter. I am laughing becasue that reminds me of something. A while ago on Catholic Radio there was this priest taking questions, and the talk turned to the occult. The priest -- I forget who he is, but he is very mild mannered, and I think he is local -- told about a time when the rectory doorbell rang late at night and it was a group of teenagers scared out of their wits. They had been playing with a Ouija board and happened on something, something that scared them. That was why they had come to the church, because they were scared. The priest took them inside and prayed, and I guess the problem was solved. I wish I recalled more of the details, but the thing is, I was too diverted by this one thing I could not help laughing about. That was the thought of these kids with this Ouija board -- you would just love to have been a bug on the wall and hear who it was that made the call. "Guys, St. Amelia's is right down the street. Let's just go." Because they had to be really desperate to show up like that! Also, I bet they never went near a Ouija board again. This being October I was thinking about scary things and one thing I thought of was this story, "The Song of Triumphant Love," by the Russian writer Turgenev, pictured above. Russians always come up with the scariest stuff. I found this story because of a CD I had to review at work that featured a narrator reading it in German and matched it up with music of the time. Well, the music of the time, whatever it was, could not measure up to the story. I found that out when I hunted the story down on the Internet in English and read it. The story is here should anyone want to read it too. Go ahead, it is October. Treat yourself! Just so you know, though, set aside an hour or so. You do not want to rush it. When I read it a couple of years ago, I was at work and it was terrible, I could not look away from it. Then that night I could not sleep. I lay awake all night staring at the ceiling, thinking about this story. And the worst thing was, I was too scared to get out of bed. I kept thinking of this one scene near the end. I do not want to give it away. You will get to it. I think this was the most frightening thing I have ever read in my life. It gets under your skin in a weird way. Enjoy! You may want to listen to Pennario playing some feverish music by Mussorgsky. The U.S. Postal Service may be failing but it has been good to Howard and me. I received the Leonard Pennario autographed program I sent away for. Well, I have not opened it yet because when Howard handed it to me I was in my bathrobe with wet hair and I did not want to smudge it. Howard received three pieces of silver that are the work of Hiram Hotchkiss! 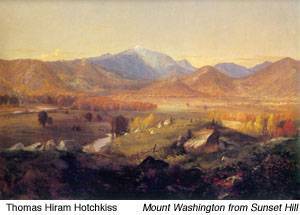 What, you have not heard of Hiram Hotchkiss? He was the jeweler from Connecticut who was the first known occupant of Big Blue. We know that from Father Dunn's book "Delaware Avenue Mansions and Families." He is not to be confused with Thomas Hiram Hotchkiss, the representational artist of the Hudson River School. 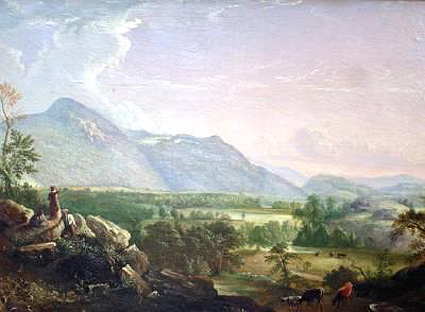 here is a Mountain Landscape painted by Thomas Hiram Hotchkiss in 1856. 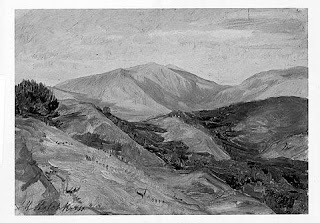 Wow, Thomas Hiram Hotchkiss (1834-1869) was pretty talented! And died pretty young. 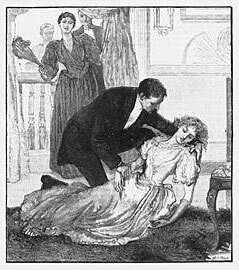 He had tuberculosis. That is not the Hiram Hotchkiss who lived in Big Blue. Nor is it this Hiram Hotchkiss who seems to have been involved in Lewiston and Niagara area affairs, as well as the peppermint trade. This seems to be the Hiram Hotchkiss we are looking for. And again, success!. We have found our man. A couple of weeks ago Howard was contacted by a gentleman in Hawaii who had come across these three forks. They are engraved on the underside with the inscription: "H. Hotchkiss." This I have seen with my own eyes! And it also says, "Patented 1860." Hiram Hotchkiss lived in the house in the 1860s. The owner of these forks offered to sell them to Howard for just the price of the silver. It came up to I forget what. Howard told me a little while ago what silver was going for per ounce and I cannot remember that either. What can I say? It has been a long day. 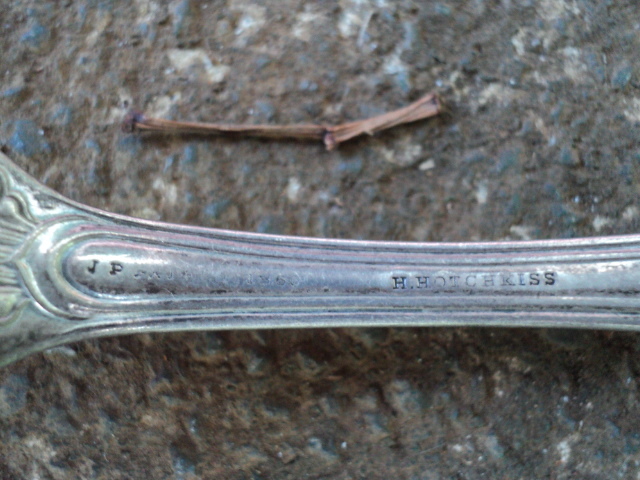 Speaking of which, it has been a long 150 years for these forks. Who knows where they have been? Who knows who ate what with them? They have an inscription "S" on the front which makes us wonder if they were monogrammed for a family whose name began with an "S." They are very beautiful and graceful. Tonight Howard and I ate dinner with the forks. We ate beans and greens and sausage with parmesan cheese over pasta. A very un-fancy dinner with fancy forks! But I did not know they were coming. Next time I will have to make something elaborate. Here is the original message I received several days ago about the Hotchkiss forks. 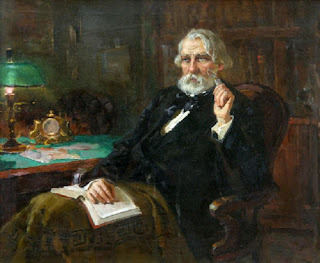 I stumbled upon your interesting blogs and the story of how you came to be the current owners of 153 Delaware after searching online for information about the nineteenth century Buffalo jeweler Hiram Hotchkiss. I live in Hilo, Hawaii, where I run a hot tub and spa business called Big Island Spa Source (www.bigislandspa.com) Since you are an entrepreneur, Howard, you may be interested to know that we have developed and are selling a solar hot tub heating system here in the islands. It is not detailed on our website, as we are trying to protect and trademark it at the moment. It was written up in Hana Hou, the inflight magazine for Hawaiian Airlines last month. My wife and I enjoy going to yard sales and estate sales on the weekend, usually loking for old LP records. We also keep our eyes peeled for sterling silver, and purchase that if it is priced far enough below current spot silver prices. 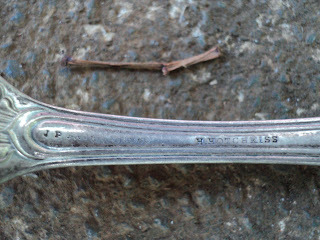 Recently, we found three coin silver forks stamped "H.Hotchkiss" on the back. Although they came from a sort of open air antique store, and they were not giving them away, they were priced below their value because they were not stamped "sterling". It took me a while to I.D. the maker, but I finally figured out that these were made in Buffalo by the jeweler and silversmith Hiram Hotchkiss. There is not a ton of information about him readily available on the internet, but I did find the address of his shop in Buffalo, and that is the very building you now own. 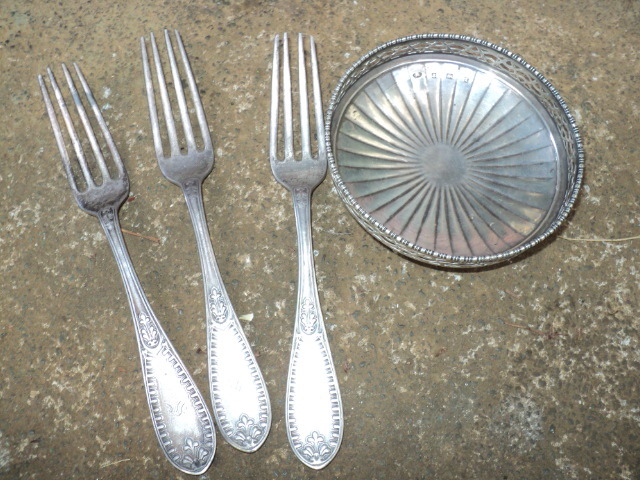 Although I like the forks, and knew that had value just from the silver in them which should continue to appreciate, I had always planned to resell them. I made some inquiries with East Coast antique dealers who specialize in coin silver. 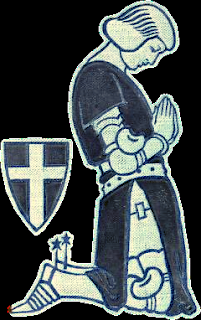 The few people I spoke with were not familiar enough with H. Hotchkiss stuff to want to make me an offer without seeing them. Living on the Big Island of Hawaii, I can't just hop in the car and take them around to show. I wondered if you might be interested in purchasing them. They certainly seem to belong with your house, and you probably know more about Hiram Hotchkiss by now than almost anyone. I am sure that you have done your own research about him and have collected information about him from people in the Buffalo area. Each fork weighs 50 grams. Being coin silver, which is 90% pure, they contain 4.3 troy ounces total of actual silver. I would be happy to sell them for their current melt value, which is $135.00 for the three. Of course I could sell them to a scrapper, but that would be a shame, especially since Hiram Hotchkiss silverware seems fairly rare and regionalized. Undoubtedly, their value as antiques is more than their silver value, but they are sure to go up in value as silver goes back up. If this offer is at all interesting to you, feel free to write back or contact me through my business. To provide assurance that this is not a scam, we can run the transaction through an Ebay auction. I am also willing to ship the forks to you before receiving payment. I buy and sell random things as a hobby, outside of my real work as a hot tub dealer. In addition to the small amount of money this generates, I get a lot of satisfaction out of making connections and matching things with people at a good price. i tell my wife that there is "someone for every thing" . I think these forks were (almost literally ) made for you, and they are an investment you can enjoy. Let me know what you think. I'll send more pictures upon request. I went to Zumba again today! This was really funny because all of a sudden there are all these guys in the class. Hip-looking guys. And here I am, skinny with no rhythm. I actually found myself looking at myself critically in the mirror, thinking: I look like this boy. I catch myself dancing bow-legged to try to make myself look curvier. Oh well. I am in this to be healthy, not to be some great dancer. Before Zumba class I went shopping with my mom. And here is where I deserve a halo around my head: There were about 50 times when I could have brought Leonard Pennario into the conversation and I did not. I just remembered last time I did and my mother got this look on her face like: Would you please never mention Leonard Pennario to me again. So I did not. 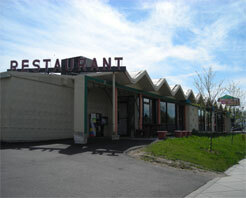 Anyway, first my mother and I ate at the Wehrle Restaurant. I had spanokopita and my mom had the fish sandwich. I stick with the tried-and-true but my mom, she is eating her way through the Wehrle Restaurant's menu. In the middle of lunch my mother says, "I am thinking, this is my favorite restaurant." I said, "I know for sure it is my favorite restaurant." After that we went to Salvation Army and wandered around but did not buy anything. Picky, picky, picky. The Wehrle is classic! It is funny because it has this German name but it is Greek. It has this classic '60s look. 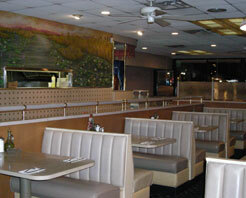 Here is a picture I found of the outside. After the Wehrle we went to T.J. Maxx. I bought three packs of tights, three pairs each. One of them was fishnet! Hubba hubba! Then we went to Supercuts where I got my hair cut. I love Supercuts. The girl who cut my hair at this one was Asian and we were talking about her husband and son, this being Buffalo where strangers talk to strangers. When we had fallen silent and she was concentrating on my hair I noticed the name on the haircutting station was Rosalyn Schwarzentrauber. Was that she? She must have married a German. His name is beautiful. According to my calculations it means the grower of the black grapes. I would love to be the grower of the black grapes! After that my mother and I went to Tops. I bought mussels and artichokes and all kinds of things. For some reason Tops had great prices on produce this week, which is a rarity. I got mushrooms, four packs, about $1 for eight ounces. And carrots. And turnip greens. My mom bought turnip greens too. I could not believe it. That is a vegetable only I eat. I love turnip greens but I did not know my mom did. I almost bought a use-'em or lose-'em pack of little yellow squash for $1, and a pack of about a pound of parsnips for $1. I love marked-down produce! But then I thought, I might go to the Clinton-Bailey Market tomorrow. So I resisted. The funny thing was, the woman behind me at the checkout bought the squash and the parsnips. I was standing there looking at them on the belt. Wishing I had bought them. There is nothing like seeing someone else buying what you passed up to make you want it. Anyway. My mom and I get back to her house and it has been hours and hours and you can tell all she wants me to do is go away. She wants to get in a nap before my brother George gets there. I wanted to talk. "Mom, this red coat you're giving away, look, it fits me," I'm saying. "I'm going to take it, OK? You don't mind if I take it." My mom was nice about it and all but you could tell she just wanted me out of there. This crazy daughter! All she does is shop and eat and talk about this old pianist, who cares? Liszt, Chopin, Schumann, who cares? 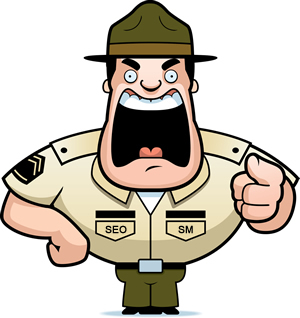 Get out! Well, I feel good because I knocked off errands. Got my hair cut, bought stuff for dinner, bought tights for work, now can deal a little easier with autumn. It was a well-spent Friday! Today I am back in the land of the living. I finally think I kicked this cold. Looking back I thought I had kicked it on Sunday. Ha, ha! Good one, Mary! Yesterday the cold and I celebrated our one-week anniversary! But today I finally felt better and went back to Zumba class. I got the idea to go to Zumba only in the late afternoon. I did not think I would be up to it because I was still sleeping with Nyquil. But, all of a sudden, I was! It was a magic moment. I realized I was feeling better! Going to Zumba was a surprise thought, a secret thought, like all of a sudden in the middle of a work day in the summer you might think: when I get off work, I am going to go to the beach. I got all excited. And after work, sure enough, there I am, parking in the parking garage, walking to the gym. I love going to the gym. It makes me feel alive. All week I had been out of it and going nowhere so I felt like a tourist in my own hometown. I wondered about Occupy Buffalo. That is this protest going on supposedly in Niagara Square. Will I hear the drums? I wondered. I had heard they were beating drums. But walking to the gym which is right next to Niagara Square, I heard no drums. I saw no evidence of anyone. The only thing I saw was, this one lost-looking hairy hippie showed up with this camera. 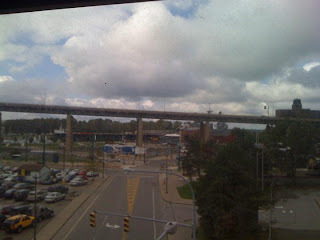 He was looking around and seemed to be heading over to Niagara Square. 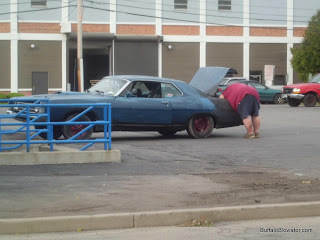 I assumed he was looking for Occupy Buffalo. I kind of nodded to him and continued on with my gym bag to the gym. 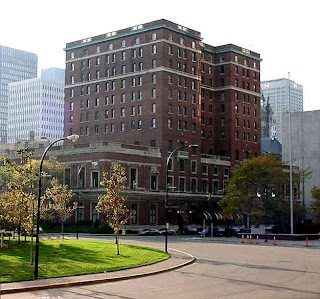 I walked up the marble steps of the gym -- this is the, ahem, Buffalo Athletic Club, where Leonard Pennario used to go, may I add -- and for some reason as I opened the door, I turned around. And the hairy hippie was taking a picture of me walking into the gym! Hahahahhaaa! I am afraid I kind of turned away instinctively, but that was just out of astonishment. I did not exactly mind having my picture taken. Heck, snap away. I always the advice Howard Stern gave to Princess Diana, based on his own experience, on how to deal with the paparazzi: "Stand there until they get sick of taking your picture." But I had to wonder why this guy was taking my picture. ... that also houses other offices. You walk up the marble steps and there are beautiful old lanterns on either side of the door. And there I was, standing on these marble steps between these lanterns, and I had on this beautiful herringbone skirt from West Germany that, I got it at a garage sale, but this hippie would never guess. I love how the label specifies that, West Germany. I was carrying a green jet bag with my Zumba clothes and I had on my nice black heels. Hahahahaa! That Occupy Buffalo person probably looked at me and saw the enemy! He was probably from out of town and saw me going into this dignified building and thought: Look, there is a bourgeois banker woman walking into this bank building carrying a green bag full of money. I am going to take her picture before I go on to Occupy Buffalo. And we can put the picture up and use it as target practice. Either that or, he recognized me as the authorized biographer of Leonard Pennario. Which, then I could understand him taking my picture. Well, whatever. Either way, I am glad to be back in the land of the living. It feels great to be feeling better! Today, continuing my convalescence, I ventured out of the house in the afternoon to go to Mass with my mom at Our Lady Help of Christians. Before I went out I bundled myself up like Charlie Brown getting dressed up to ice skate. As I was trying to figure out what to wear I inventoried my winter coats. And there was a coat I could not remember ever seeing before. This is actually a normal experience for me. I like to buy old things and very often I forget what I have. I took the coat out of the closet and tried it on and looked at it. It is a long black coat, cinched with a belt at the waist, with a Bloomingdale's label. 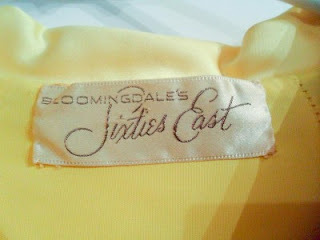 It read "Bloomingdale's, Sixties East." Like the label pictured above! Only this coat is black. A label farther down reads "Jonny Herbert Original." I liked this coat! It would sort of make people stare if I wore it to Our Lady Help of Christians. But it would be nice for an evening occasion. The real payoff came when I looked in the pockets. In the right pocket was a chapstick I recognized as having been a present from my sister and my nieces, Rosie and Millie. They made these wonderful chapsticks a few years ago. Ah, so I had worn the coat before! And now I had a chapstick which was nice. The left-hand pocket was a stranger story. There were two little vials of some kind of, I believe it is contact lens solution. Ancient contact lens solution! Some of it is still in there. The one bottle, the label is worn off. The other is labeled NeoDecadron and it expired in 1978. Over 30 years ago! That does not leave the pocket. That stays! I must have made that decision a few years ago, or whenever it was I wore the coat. Because here the vials are, still here. Along with the two vials I found $40! Was that God rewarding me for getting up to go to Mass or what? I celebrated by blowing a portion of the proceeds on eBay for an autographed Leonard Pennario concert program. It is not as if I do not have any Pennario autographs but I liked the classic look of this program and it was one I did not have. In classic red and black it reads: "Columbia Artists Present PENNARIO." Just his last name. No "Leonard." I love that. Leaving the house today to go to church paid off! Zut alors, I have caught cold! I am going to say it that British way from now on. Yesterday I could hardly even get out of bed! I slept and took Nyquil and slept some more and in between I did a little bit of work on my book. 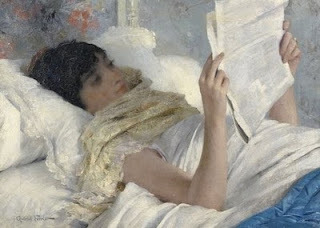 Above is a painting of me poring over old newspapers. I usually could read for about five minutes and that was about it. One thing, though, through dumb luck I was prepared. When Howard said to call him if I needed anything I was able to say that I was pretty sure I did not need anything! Because I did not. A couple of days before I had made this gorilla chicken broth, I mean I really had not worked on it, just tossed some bones and an onion into a pot and simmered it for a couple of hours. When I put it in the fridge I remember thinking, why did I bother with this? Well, thank God I did. Because yesterday it came in handy, bones and all. I did not even strain it! I was too weak. I just skimmed the fat off it and then cooked some carrots and onion and celery in it and some leftover pasta and then poured hot sauce into it and ate it. Yum! Today I made spicy chili. That was easy because for some reason I had cooked up a pound of pinto beans a few days ago. Again, yay me! Plus today although I was not able to leave the house at least I could stand on my feet again. Well, things could be worse. At least I do not have to go out on a concert stage and play a piano concerto. Pennario used to do that when he had the flu. He used to just go. Out. And. Do. It. But I have to say, I did deal pretty well with this cold. I think by tomorrow I should have it beat. I credit the chicken soup and the spicy chili. Thank God I have me to take care of me! Remember that killer class I talked about a while ago? Today at work I was underslept and out of it but it came time for that class and I was planning to go and so I considered going. I went back and forth on it, there at my desk. It seemed unimaginable that I would get up and go. ... yelling at me. That made it extra tough to jump. It is hard to jump when you are laughing. You also had to shimmy up the bar and down the bar -- I mean, while it was lying on the floor. You put one foot on either side of it and you shimmied. Hilarious class. I was trying not to look at the guys in the class doing this. Leonard Pennario used to go to the downtown BAC. He was a good looking man, was Leonard, but I do not think he ever did ABC class! Or Boot Camp, as it is affectionately called. I wonder what I will feel like tomorrow. I have a feeling parts of me will hurt. But the bright side is, it was just a half hour class. You can do anything for half an hour, you know? It is not a long time. And I have to say it woke me up. I had been asleep before that! I walked back to the office and bingo, I was back in less than an hour, and I was wide awake and finished the stuff I had due. Howard took this picture. It is a Buffalo classic! That car! 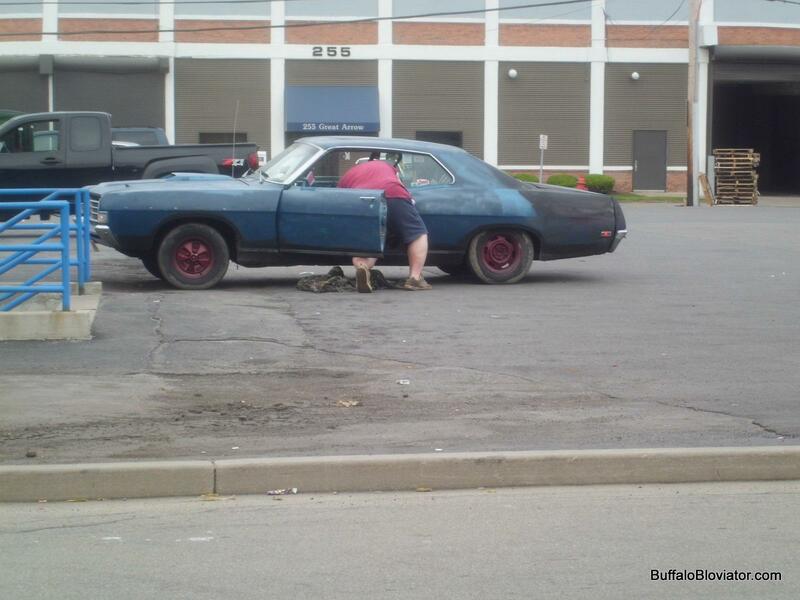 It is a classic Buffalo vehicle. 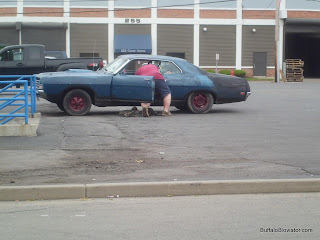 Howard said that a few minutes before he took this picture the guy was completely under the car with only his feet sticking out. It is too bad he could not capture that. But he did take this picture a couple of minutes after taking the first one. That is the Pierce-Arrow plant in the background. Back in the day they would build the Pierce-Arrows there and drive the cars around on the roof to test them. 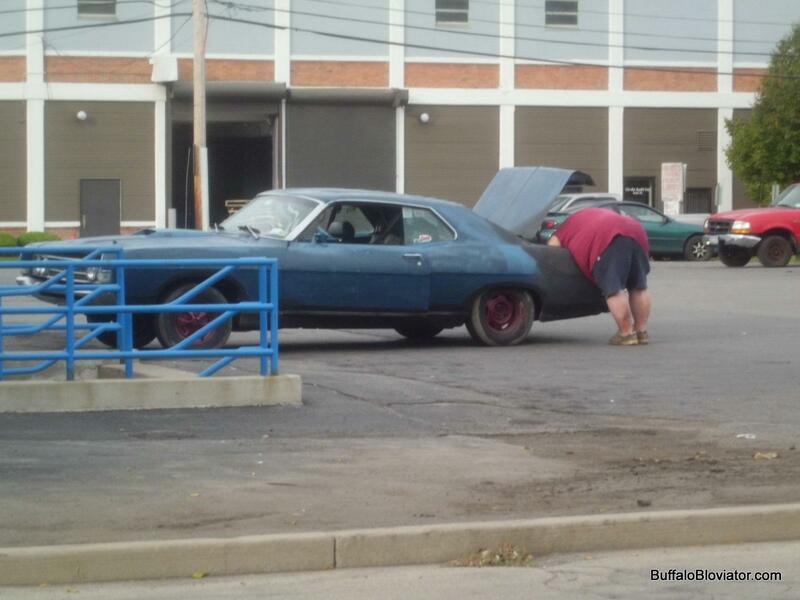 Buffalo produces things like that guy and that car in the picture but we have also produced wonderful top-shelf things like the Pierce Arrow and Leonard Pennario. Last night Howard and I laughed and laughed over these photos. Buffalo, you got to love this town. We are so without vanity! Remember the peach chutney? Perhaps you do not. It was just a footnote in my life last week. Well, it sure was not a footnote in my life yesterday. That was because it was such an extreme pain in the kiester, to use a beloved Buffalo expression. Isn't it funny how you can do something once and it is no sweat at all, la la la la la -- and then you try it again and it is a major endeavor? That is what happened yesterday. Perhaps the peaches were different. Perhaps the barometric pressure was different. I do not know what it is! What happened was, my brother George dropped off another huge amount of peaches from the Clinton-Bailey Market. He did that on Saturday, the day I was having a party for a bunch of people from work. People always drop off use-'em-or-lose-'em fruits and vegetables only happen when I am having a party and the pressure is on. I did manage to get the peaches out of the big plastic bag immediately, but even so they began to rot as soon as I looked at them. I mean, you could stand there and watch them and see them going before your eyes. I ate a few of them and they were delicious but you can only eat so many peaches, you know? On Sunday I had Leonard Pennario correspondence to take care of and I did not get around to the chutney until the evening. What a struggle! They would not peel! 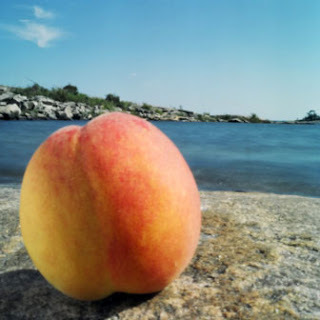 It is not as if I do not know how to peel peaches either. You dunk them in boiling water and then the skin slips off. I did it just last week with no problem! Last night not only did it take the water forever to boil but every time I put in a load of peaches it would take the water forever to get boiling again. Then I could not get the skins off the peaches, could not. The onions would not peel either. When I chopped them it was like mustard gas! My eyes were killing me! Finally the stupid chutney turned out soupy and I had to cook it and cook it and cook it and still. At least I made the time count because I had a Pennario phone call to make, to one of his old friends, and I had been wanting to find time for that. This was that time! Now it is the next morning and the stuff looks OK. But what in the world, you know? Last week this was easy! 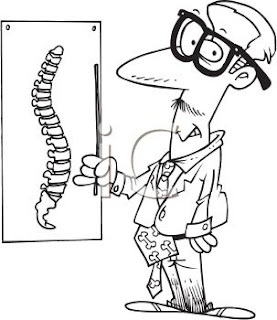 Yesterday I had to go to the chiro and I got adjusted. I go to a special chiropractor who follows a method called NUCCA which means they do not step on you or crack your back or do anything violent. All they do is press behind your ear. It actually makes me want to giggle. The chiro tells me, "I'm going to have you lie down on your side." It is always in those words! So that is what I do. ... only my chiro is a girl. But the thing is, whatever it is, it works. When I went in to see the chiro for the first time a few years ago, I used to notice in Pilates class that my knees did not match up, that one of my legs seemed shorter than the other. The chiro told me that was Short Leg Syndrome and it would soon be corrected. Which it was! After my first adjustment she told me the Short Leg Syndrome would be corrected in a few hours. Yeah, right, I thought. I will believe this when I see it. But it was! I got down by the file cabinets at work to check. I looked at my knees and they matched up. Well, yesterday was a different matter. I was out of alignment and I got adjusted and then right after that the pressure began. You have to lie on the table for a while so that the alignment takes hold. So already I am stressed because I worry I will be missing work. Then you have to get through the day without upsetting it. All day long I felt as if I were balancing, on my head, a very big and very expensive and very fragile glass vase. I even read that a thought can upset your adjustment! I took care and did not go to my Pilates class or do Zumba. I tried to sit straight in my car which, good luck trying to sit straight in your car. It is very hard to do! Then I did not drink too much wine. 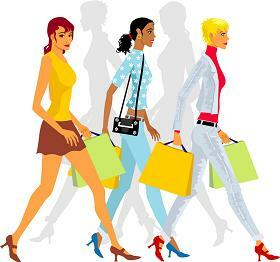 Chemical imbalance can throw off your adjustment! I did not cross my legs. At work I sat up straight in my chair. Every hour I got up to walk. However! I was in my car and ... doh! What I did was, I was stuck at a light, and I leaned forward in my seat and tipped my head back. I heard this cracking, popping sound. There goes my adjustment! That was all I could think. Then I did not get much sleep. I was up at 5 a.m. attending to Leonard Pennario business before work. That probably did away with my adjustment if my mistake in the car did not. They are hopeless, these adjustments! 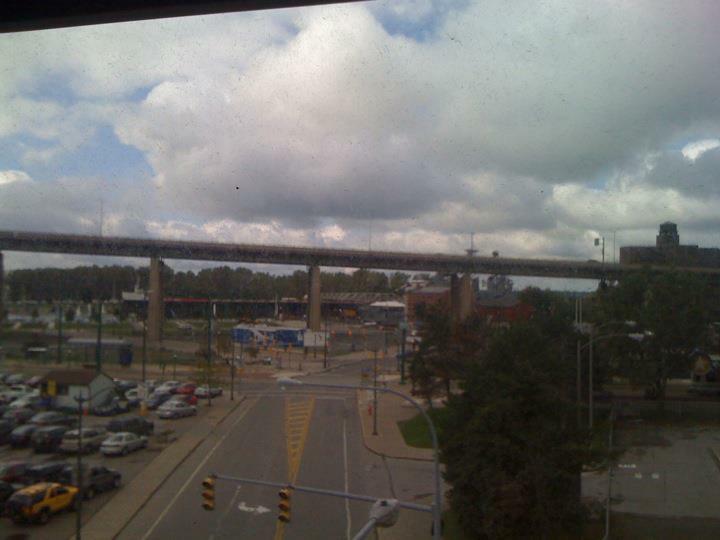 Yesterday at my desk at work I took this masterful picture of the American Mariner sailing out of the Buffalo harbor. I took it on my phone and posted it on my Facebook page. Isn't it funny, you just cannot explain the things that thrill you. My brother George and I, just as an example, we are both interested in old things in general: buildings, preservation. However my interest extends into industry and George's does not. I love old factories and he does not. And I love these Great Lakes ships. I did not even have to see the writing on this one to know that it was the American Mariner. Because no other ship is as big and now I have a practiced eye. Big Great Lakes freighters, I love looking at them. I love the lore that surrounds them. It was a thrill for me to meet the captain of the American Mariner, Captain Dan Bartels, and write about him for the paper a while ago. He lives across the street from my mom, is how I got to meet him. From time to time I kick around ideas of things that would be fun to explore once I have completed my book about Leonard Pennario, not that anything could ever be more fascinating than Pennario. Great Lakes shipping could be one thing! I just think I could do a good job with that. 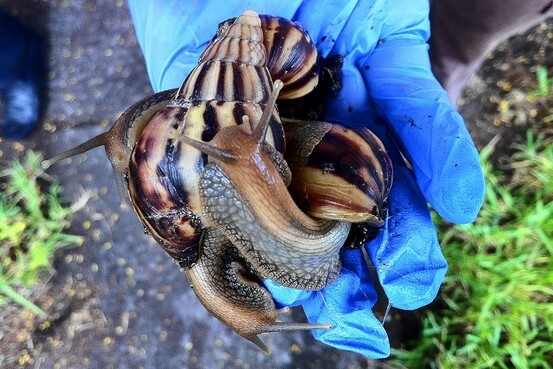 Miami is beset by giant snails! There is a story about it in the Wall Street Journal and above is the Journal's picture of one of them. They can grow to be eight inches long! These are not picturesque and exotic and thrilling creatures like the Great Pink Sea Snail in "Dr. Doolittle." They are huge slimy revolting creatures! There is this one sentence in the Journal which I have to quote in case you cannot access the story. Ahem. "The snails' engorged bodies extend far from their shells, and they eat so ravenously that they leave trails of excrement on the walls and the ground." The Journal reported that one woman went out of her house and saw one of these snails and immediately got a migraine and had to lie down! That is how you tell it did not happen in Buffalo. Had it happened in Buffalo we would have written that she had to "lay down." Buffalo just cannot get that right! But do not get me started on that. I do not know how Leonard Pennario wound up with his impeccable grammar, growing up here. One very problematic thing about these snails, they can reproduce themselves. 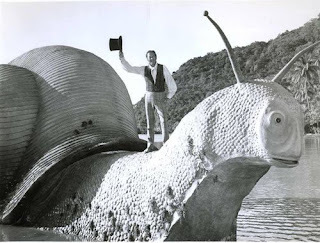 They do not need another snail! So there are eradication teams now going from house to house. As the story says, they just remove and remove and remove. Because if you leave any one of these snails alone with itself for any length of time it will lay a million eggs. There was one investation in 1964 when a kid brought three home from Hawaii and kept them in a terrarium and his grandmother eventually let them loose in the backyard. That infestation took 10 years to subdue! Just one more reason why I am glad I live in Buffalo. Buffalonians might not know "lie" from "lay" but at least we do not have to deal with tropical pests! Yikes, I fell behind over the weekend and am going to have to do some catch-up again. The last two weeks have been mayhem with the book and with work but the next couple weeks should be more on an even keel. 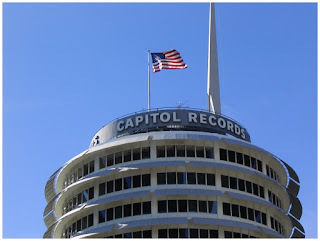 One thing I did recently was call Capitol Records. They have some of Leonard Pennario's recordings still in the vaults and I wanted to inquire about them. I am at the point as I craft my, ahem, masterpiece when I am working on tying up a lot of loose ends. It was funny because this guy I reached, it sounded as if he was not used to getting phone calls. He answered in a way that made you think he was hiding something. That is the way you behave when you are answering the phone in a vault! Once I worked in Manufacturers and Traders Trust's Safe Deposit Vault and that is the way I answered the phone too. Hahaha! I was a temp when I worked at M&T and they put me in that powerful position. On my first day they were training me on how to answer the phone, what to say, what to do, in the remote chance that it rang. They are carrying on in utmost seriousness and in the middle of the training, to my shock, the phone rang! This phone, deep in the vaults, in the middle of nowhere. "Go ahead. Answer it," the suit who is training me says. She and the other woman fall silent, waiting to see what I say, how I deal with it. So I pick up the phone. "M&T Safe Deposit Vault," I say. And all I hear is this laughing. It was my brother George! Hahahaha! George and I had a joke back then about tracking each other down no matter where we were. And this was before cell phones, when it was challenging. Well, the woman training me at M&T was not amused. But back to the guy in the Capitol vaults. I pictured him in some windowless office somewhere. Just him and one of those old black phones. I explained who I was and what I was up to and he listened in silence. Then he said, "Don't hold your breath." That has to go in the book! Later I realized I had emailed this guy about a year ago and he had never replied. That is OK. I am glad I am not the only one who drops the ball on stuff. I am ready to go forward. In our phone conversation the other day, which was brief, he asked me to send him an email with recording dates and numbers and everything. Which I did, that same day. Now I am following his instructions and not holding my breath. 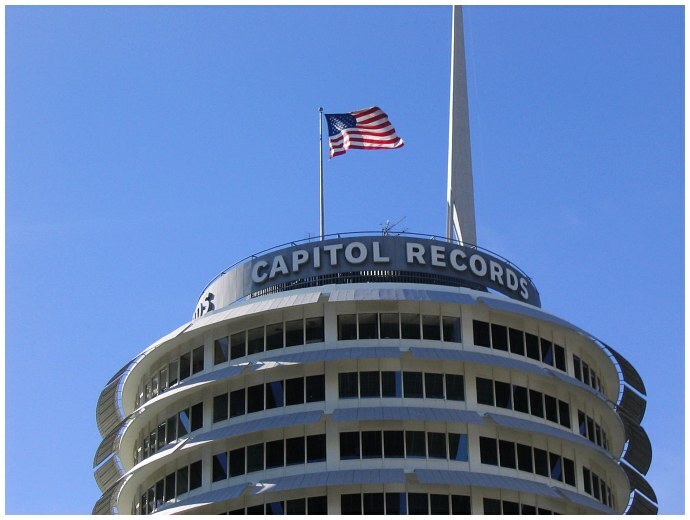 Perhaps they are overworked there in the Capitol Records vaults. All I can think is, Pennario fans are clamoring constantly at the gates. But I do think things will work out with Capitol, or EMI I should say, because they are part of EMI. They are still their own division though. That is nice. I have various ideas and questions I floated in my email and I do believe this book is a good project and something the world needs. Things work out with it. People who were lost turn up. Things I am looking for come my way. Pieces fall into place. Remember the Divine Assistance? I think that I feel it. And if you can say that on a Monday morning, it must be there!